Wasa 530 is one of the last boats in the Wasa family. 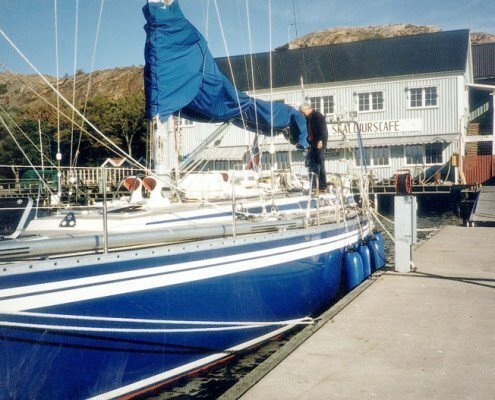 She was launched as a cruising boat, large, spacious and comfortable without any real requirements for sail racing but still a boat with typical Wasa characteristics, meaning fast and easy-to-handle, despite increased size. When the boat was launched there were plans to call it Wasa Pacific, as a connection to the Wasa Atlantic, but even more exotic – a sign of the special character of the boat as a powerful ocean cruiser. Wasa 530 is one of the latest boats in the Wasa family. When launched in the late 80’s, it was the intention to make a clean cruise boat. Large and spacious, without ambitions in the field of racing. Within the 53 feet, the goal was to maximize the waterline length to get max speed. The boat should become a “passage maker” and be able to traverse long distances per day. “Wasa 530 reminds the Wasa 410, but with larger volume in the bow to withstand the weight of windlass and chain. She is a 53-foot long distance sailboat. There is nothing that needs to be reinforced, just set sail and go, “says Wasa Yachts chief Hans Marklund. Compared to Wasa Atlantic, the closest to its size, the Wasa 530 is a much heavier boat. These are two completely different concepts. With Wasa Atlantic, Leif Ängermark / Hans Leander continued the elongated, low-displacing (7.5 ton) concept. The Wasa 530 is only half a meter longer, but displace 15 ton, which is quite normal for this size of ocean cruiser. 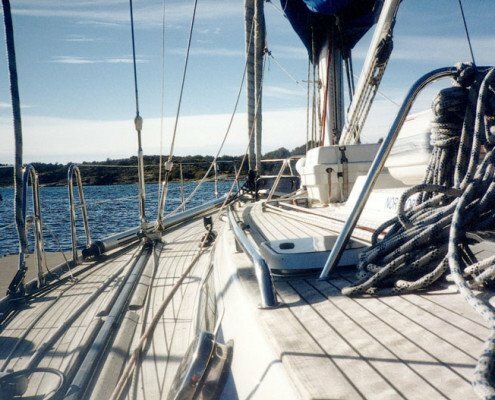 Since the sail area is clearly larger, a heavier keel is also required, another contributing factor to the weight difference. 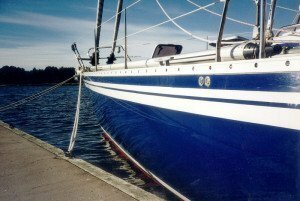 The big displacement makes the boat less sensitive to all the extra equipment that the long distance sailor wishes to bring aboard. 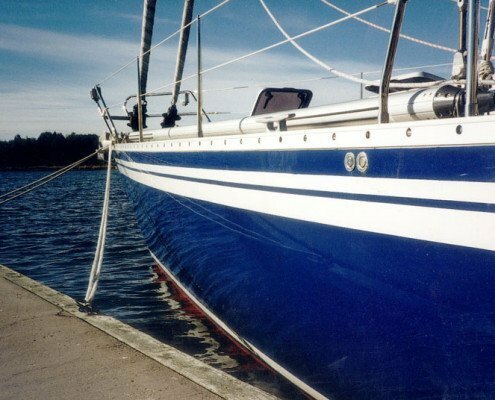 The Wasa 530 has the typical Wasa keel, trapezoidal and deep enough to give a powerful bite when sailing closehauled. 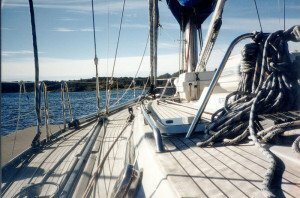 The keel weighs six ton, which contributes to a good stability. The rudder is detached and without skeg. The Wasa 530 has an almost straight deck line with a low superstructure that continues aft in the same level as the cockpit coaming. This gives an elegant look without traces of trendiness. The robust coaming provides good protection for the spacious cockpit. The design under deck reflects the goal of creating a functional long distance sailboat, meaning a boat that works as well under sail as in the harbor. 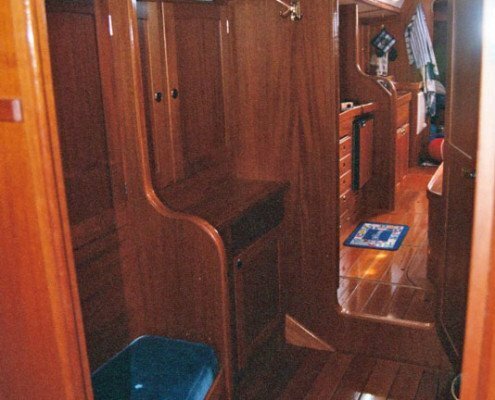 Wasa 530 has four separate cabins, each with double bunks. Two of the cabins are sterned, with wide double bunk beds, large floor space and spacious wardrobes. The other double cabins are located immediately in front of the main bulkhead. This location closer to the boat’s center provides calmer motions in the sea. Both cabins are fitted with a lower and an upper bunk. Each cabin has its own entrance. The two cabins share a toilet / shower, but with their own entrance from the respective cabin. 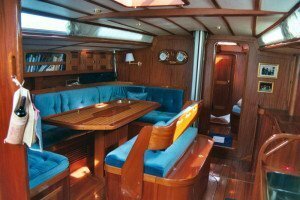 This layout allows for several “private spheres” that are desirable on long distance sailboats. Another sign of the functional thinking behind the Wasa 530 is the large floor space below the cockpit entrance. Here is room to move about and to undress wet sail clothes and hang them away. To starboard there is the large navigation station with space for instrumentation. Here is also another wardrobe. The salon has a spacious U-couch, a fixed table and a smaller sofa along the aisle. The width of the hull allows the kitchen to be placed along the opposite hull side where it extends along the entire length of the salon. There are double sinks, 3 burner stove with oven and large fridge compartment, as well as generous work and deployment areas. The kitchenette also has plenty of cabinets, drawers and shelves. At the front of the forecabin there is a special space for sails and other bulky equipment. 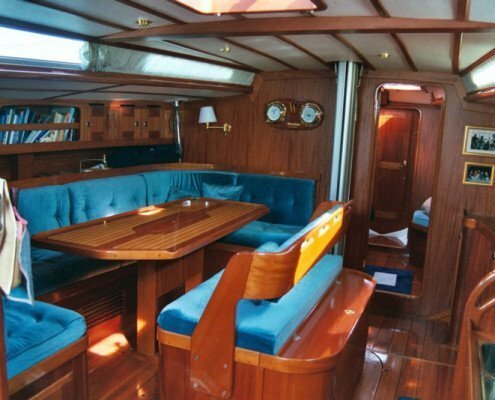 The entire layout combines comfort and well-being with very good function during sailing. Wasa 530 has a stable masthead rig from Seldéns. 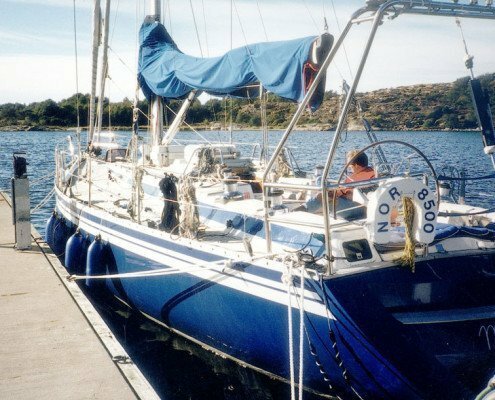 The mast is slander for small winds resistance, but stands steadily with three straight spreaders, inner forestay and backstays. The mast is of course continuous. The sail plane is designed for the genoa in really light winds, but the boat sails well with just jib from about 5 m / s.
Hull and deck are in balsa sandwich, with a keel area in homogeneous GRP. The thickness is up to 75 mm, and the strength is increased further by the sturdy and high bottom girders.